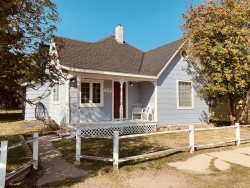 Lazy M Villa is an incredible vacation rental in Red Lodge, MT! This home has you at hello. Views, hot tub, pond, killer kitchen and sleeping 8-10. Books up quickly so make your plans! Enter the foyer of this beautiful home and be greeted with the exceptional craftsmanship that resonates throughout. The soaring ceilings in the main living area and abundance of natural light echo the view of the Montana sky through the windows. Sit back and enjoy an evening of relaxation with the warming flames in the floor-to-ceiling rock gas fireplace. The chef of the group—or multiple cooks!--will appreciate the fine details that the kitchen has to offer. From the breakfast bar that seats up to six people to the table ready to accommodate eight, you’ll find conversation easy. Lazy M Villa is full of convenient comforts to make you feel right at home including cable TV for HD TV's and with built-in DVD players. Two bedrooms on the main level are furnished with sumptuous king beds with down-filled linens. The master suite has a spacious bathroom and a covered patio with seating that overlooks the serene pond and fourth green of the Red Lodge Golf Course. There is an additional full bathroom on this level for guest accommodation. The upstairs bedroom is furnished with a luxurious queen bed. There are two full futon sleeper sofas for additional guests. There is also a 3/4 bath with walk-in tile shower. Enjoy the upper covered balcony with pristine views of the pond below and the vista before you. This home is equipped with WiFi so please bring your laptop or portable device to stay connected (We hope you can DISconnect while in our lovely community!). There is a small office set apart for business needs. Don't forget to bring your swimsuit to relax in your private 8-person Jacuzzi after a summer day of golfing, a winter day of skiing on Red Lodge Mountain, or an anytime of year day spent hiking in the vast and gorgeous Beartooth Mountains. A perfect ending to a perfect day! The large half-moon patio is steps away from the Jacuzzi. There is also an outdoor gas fireplace for cool evenings. In the summer months delight in the seasonal stream that flows by into the neighboring pond. We had a wonderful stay at the Lazy M Villa! We enjoyed the mountain views, the hot tub and the spacious kitchen and living room area. Thanks! This was a wonderful home. Beautiful and in wonderful location. Extremely relaxing. Location is very quiet w/wonderful amenities. Would highly recommend for family trip or group trip. The pictures were great and it matched the home. The best part of our stay was family getting together. The place is so comfortable for two families. LOVED: The Antique Mall was a blast! Highly recommend the agency and the home. Very relaxing patio area! We really enjoyed all the outdoor amenities. Beautiful and peaceful place. Second year in a row that I have rented this unit. I like the way it sets back on the street, kids loved the little stream and pond. One of the most relaxing vacations we have experienced. Very satisfied - exceptional communications! Very comfortable for our family, plenty of space. Loved: Brew Pub was great, Red Lodge Pizza, Beartooth Highway Wild Bill Lake, hiking paths, no traffic and end of cul de sac, views from house master bath shower - awesome! This facility is absolutely lovely. It is so cozy and comfortable. I loved cooking in the spacious well-equipped kitchen. I also so enjoyed the floor plan and all the great natural light. We had plenty of room. We Loved: The Candy Emporium - its our annual fun spot! We love the variety of choices and lovely old fashioned choices. Great place, great views, patio very nice, very clean. Loved the look and location. Pictures were done very well and reflected the actual property perfectly. Great home for a family or 3 couples. The bathrooms are done beautifully, kitchen well equipped, beds comfortable. We love the house, the yard, the view. Everything is great! Well-equipped kitchen. Hot water excellent! Hot tub too! Everything is superb. Very satisfied with the very comfortable beds and pillows. Excellent craftsmanship and style of home! The furniture is very comfortable and pretty! Also the TV, video/DVD and stereo system is a bonus! We all really enjoyed the comfort and beauty of your rental home and also scenes of this area! We will definitely return. This was our 6th family vacation to this town!! Our family - age 20 somethings and ourselves really liked Bogarts (the burgers were awesome, our 19 yr old even remembered their quest dip from 7 yrs ago when we were here. Mos Tacos was also very fresh Mexican and yummy. beds were comfortable, house is lovely and very clean! Loved the extra towels available. Gorgeous house with lovely views! Such a wonderful place for vacation, quiet neighborhood. Wonderful kitchen! We loved the master suite and all of the porches. Great house for a ski vacation. Loved: Red Lodge Mountain, Red Lodge Brewery (wonderful beer! ), Foster and Logans great food! Great private lessons for our party at Red Lodge Mountain. Very convenient, lots of bedding, super homey.